Bologna is medieval town located in Northern Italy in the Emilia Romagna that was founded by the Etruscans and has since thrived as a popular trade and learning center. It has a population of nearly 500,000 and is home to the oldest university in the world, University of Bologna, founded in 1088. Bologna is a bustling, animated city full of liberal students and wealthy Bolognese families. People born here are very loyal to their city and often stay their entire lives. But it is the student population of 100,000 that dominates the city. Everywhere you turn you’ll catch young people protesting for freedom or walking arm in arm down the streets. While the center is often crowded, you can veer into the elegant residential areas to get a peek into the daily lives of Bolognese families. Margherita Park and the surrounding neighborhood is a lovely area of town to seek solace and spend a peaceful Sunday. Bologna’s center is very striking with its medieval street plan, two historic towers (“le due torri”, the torre Garisenda and Torre degli Asinelli; the second one, with its 318ft., is the highest leaning tower in Italy) and warm colored buildings of red and orange. The first thing you may notice is that most of the city is built under porticoes, which are covered walkways. This is very convenient when you are stuck in the frequent rain or snow, but it can seem a bit darker when you don’t see the sky. The reason they are so common is because they were primarily offered as a tax incentive to estate developers because it was considered a service to the town. Some of the richest families chose to build without porticoes to prove their status. Ferrari S.P.A. was created in Maranello, a town 20 minutes from Bologna. Lamborghini and Ducati motorcycles are also from this area. Every year the convention center in Bologna hosts the Motor show, one of Europe’s most important motor exhibitions showcasing the world’s fastest cars and bikes. A car is unnecessary in Bologna. The preferred method of getting around is by bike or foot. The bus system is very easy to use if you take ten minutes to learn the different lines. At the major bus stops, a bus comes every five minutes and run until around midnight. The fare is about 1 euro and purchased by self-service machines onboard the bus. Tickets are rarely checked. Otherwise, you’ll do just fine by foot or bicycle. The train station, Bologna Centrale, is located half a mile from Piazza Maggiore, the city center and is a major hub of Northern Italy. 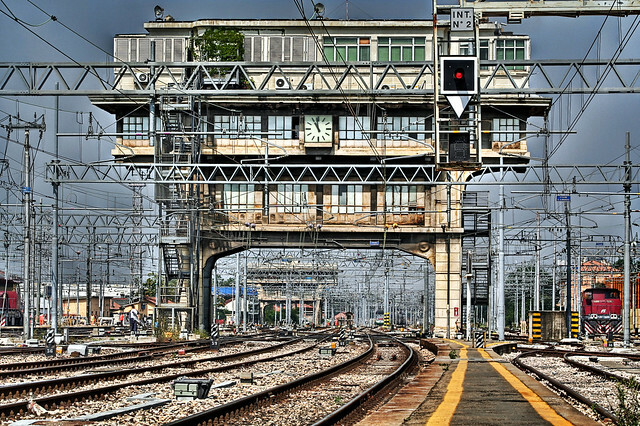 Two major train lines run through the station, and Bologna is a crossroad of trains coming from Milan, Venice, Rome and Puglia. Don’t forget to get your tickets stamped before entering the train at yellow self-service machines located all around the station. The major airport of Bologna is Guglielmo Marconi International Airport. In order to get to and from the city center to the airport, you can take a taxi or the airport bus (pickup is outside of the train station or airport) for about 10 euros. If you come to Bologna for one reason, let it be the food. It is informally the culinary capital of Italy and it isn’t nicknamed –Bologna la grassa– which means “Bologna the fat” for nothing. The market in the city center is one of the largest in Europe and has a huge array of fresh cheeses, meats, fruits, vegetables, dairy and baked goods. The best deals are the balsamic vinegar from nearby Modena and prosciutto from Parma. Galleria Cavour is the home of Louis Vuitton, Armani, Fendi and other luxury shops. Aperitivo is Italy’s version of Happy Hour that is not to be missed. Every night between around 7 and 8:30 most of the bars and lounges host a complimentary buffet of sandwiches, salads, and appetizers with drinks. One of the greatest pleasures of being in Bologna is that is it an ideal base to explore other cities in Italy. You are within hours of most of the major cities of Italy or a quick train ride to the vineyards of Tuscany. For an easy and relaxing day trip, top choices are Parma and Ravenna, which can be reached in under an hour. Milan: 1 hr. 20 min. Venice: 1 hr. 40 min. Rome: 2 hr. 30 min.